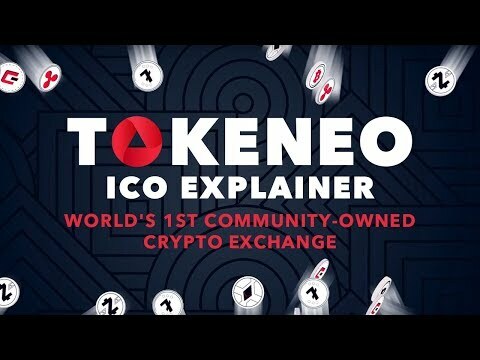 Tokeneo is world's 1st Community-owned Crypto Exchange, which rewards its investors with 50% of the income, paid out on a daily basis. Tokeneo community owns 90% of the Ethereum-based TEO tokens. Our investors participate in the exchange's development. Tokeneo is a crypto-currency exchange whose investors are rewarded with 50% of the income, paid out on a DAILY basis. Tokeneo community owns 90% of the Ethereum-based TEO tokens. Our investors participate in Exchange's development. The top priority was to offer a token that provides a real passive income and a secure and steady source of regular proceeds WITHOUT the necessity to speculate. - Guaranteed 50-50 distribution of income between TEO holders and the exchange. - Regular passive income for every TEO holder with daily payouts. The MVP is going to be available when ICO starts. - the very first Polish cryptocurrency fund Cryptoinvestia.io which aims at making it easier to enter the cryptocurrency markets for the persons who are only learning the nuts and bolts of the blockchain technology. - Tokeneo.blog service (in Polish) which is aimed to be main educational and news crypto-hub in Poland. I like how they value community first. Its an interesting concept but not sure how the regulatory work is like for sharing the profits (securities?). Decent team but i think they can pack on more advisors for sure. Overall, decent project. MVP looks good as well. Unlike most projects, they actually have a MVP. On top of that, roadmap looks realistic. That said, the key for any exchange is a lot on marketing and they have to definitely find a way into the market if they want to succeed. I appreciate you review and overall positive feedback :). We are working hard with both development and regulatory requirements. Good that you noticed MVP; you reviewed when it was already available. This project looks similar to the premise of a "fee split allocation". Please read my blog post at https://blog.spiking.com/will-it-moon-34dea6f5a65c. At this stage, is this ICO considered a utility or security token? Is it based in Poland? Looking forward to the team's response. The idea that projects and investors build perfect equality is very unique. If they succeed in this plan they will create a new era. I think that we want this project to succeed, but there are concerns. It is that no financial plan has been presented since the start of the project. The mystery encompasses what kind of financial plan the project will manage the exchange. If it becomes obvious I can really judge whether the 50-50 relationship is reasonable. We also recommend that you clarify (materialize) the following parts of sources of prospective income of the Tokeneo exchange. "The examples of such sources can be gains generated by trading bots in the open Tokeneo markets, gains from mining and nodes, investments in cryptocurrency funds or paid project promo project promotion." Also, according to the plan, the project should soon announce MVP. I will wait for this and revise the evaluation. * They ran MVP and the team got even better, so I revised the evaluation. I’m looking forward to it mainly because it’s a community-based project and also the daily payout guarantees a regular source of passive income for investors. Tokeneo ICO started on 8th October 2018 and ends on 30th December 2018 and considering the data; this ICO might do very well. The price during the ICO is 0.0275 USD which is reasonably fair for a new token breaking into the crypto market. There are 80,000,000 TEO tokens for sale and compared to other new platforms that offer a lot of tokens for sale, Tokeneo is quite fair. The soft cap and hard cap of this token are 3,000,000 USD and 10,000,000 USD respectively which is very considerable. This project has an Interesting concept, a solid team, and the advisory board, I like the prospects of this project. An exchange who belongs to the investors its a special and great idea. The investors do also decide how the platform should be developed. Its nice but it could get difficult to find consensus. This is a way to have a regular passive income, because every TEO holder gets daily payouts guaranteed 50-50 distribution of income between TEO holders and the exchange. I hope the concept will get many people who wants to join this concept and makes it succesful. I will re-rate the product when the MVP will be available at begin of the ICO. Now I give a 3. Wish you guys good luck! Thank you for taking an effort to make the review of our ICO :). And sorry for late reply: just finished with KYC and the email which ICOBench would like :). I clearly see that the general idea is liked by experts, and we need to polish it. Well, most of us are from Poland, so it should not be a problem ;). So: regarding MVP: this is LIVE: www.tokeneo.com. Please take a look to have a glimpse of what we plan to build. Good team but could find a few more advisors for sure. The fact that the community can participate become partners and share in profits is an intriguing thought and that will grow on many investors. I will say that it would be good to see more of the team’s financial plans. I do believe this project can make change in the future and stand out like some of the biggest crypto exchanges in the world if not better. MVP is available and working good. Thumbs up by me and wish this project all the best. Working Beta. ICO End Date. Tokeneo.cash. Tokeneo 1.0. Fiat integration. Min 50 markets.